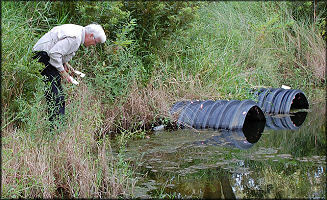 Acting on information that channeled apple snails were living in the water hazards at the Sea Island Retreat Golf Course on St. Simons Island - information provided by the Georgia Department of Natural Resources (DNR) - this reporter and shelling companion Dr. Harry Lee visited that location on 9/7/2007 to see for ourselves these molluscan golf enthusiasts. 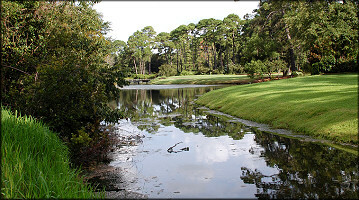 The DNR had reported the snails were present in most of the course water hazards which were all interconnected. However, time constraints permitted us to peruse only a small part of the overall system. 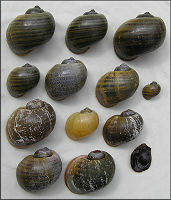 Empty Pomacea shells and a modest number of fresh egg clutches were found at the three locations checked. Although adult living specimens proved elusive, Harry eventually collected a single living 25 mm. juvenile specimen. While a breeding population of Pomacea maculata was obviously present in the areas checked, the relatively modest number of fresh egg clutches seen, combined with our inability to locate any living adult specimens, suggests that the population may be quite small. 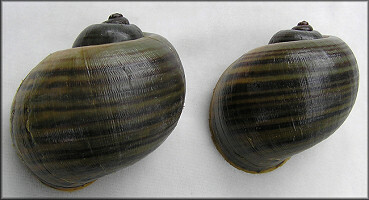 Thus far (9/7/2007) channeled apple snails have been found at five different locations in Georgia: Blackshear, St. Marys, Alma, Quitman, and St. Simons Island.